The Portable RV Water Softener was designed to soften the water supply in RVs and can easily be installed inline with your water supply or to fill your fresh water tank. It can also be used to soften water in boats, carpet cleaning machines, spas or Jacuzzi, patio misters, humidifiers, espresso or cappuccino machines, aquariums, etc. It’s easy to connect with water hose fittings (included) to any water hose (not included). It can be installed and used in any position (other softeners must stand upright) and the water can flow through it in either direction. 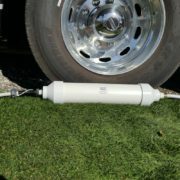 Unlike other water softeners you cannot lose your resin and contaminate your RV’s water tank or water lines by hooking it up backwards (accidental back flow will not cause any problems). The resin can be regenerated easily with salt water. The resin beads inside the WaterStick soften water through a process called “ion exchange”. The resin beads attract hard water minerals such as calcium, magnesium and iron. As the minerals pass over the resin beads they stick to the surface of the beads which traps them inside the WaterStick. After the resin beads collect all the minerals they can hold, the resin needs to be regenerated. This will flush out the hard water minerals the resin has collected.